Figure 8.12. Schematic view of a tokamak MCF rocket using a divertor. effect, and allows plasma to be reasonably well confined. The same figure shows also the so-called ''first wall'' of the confinement structure, that is, the solid confinement structure (for instance, stainless steel) separating the plasma from the coolant blanket, the volume occupied by molten lithium that cools and at the same time absorbs the high-energy neutrons breeding tritium, followed by the radiation shield proper and the magnet. It is the thermal energy extracted mostly from the blanket that can produce electric power through conventional thermodynamics. Figure 8.13. Schematic of an advanced (spherical torus) tokamak reactor (spheromak) showing first wall and thermal insulation. Unlike all MCF concepts seen so far, this approach to MCF is unsteady. The basic working principle of the DPF rocket is shown on the left of Figure 8.14. The fuel, DT or other, is injected inside the reactor chamber and is compressed by pulsed electromagnetic waves. Their effect on the newly formed and longitudinally accelerated plasma is to constrict the B field lines in the tangential direction (in cylindrical coordinates the tangential angle is 0). This unsteady plasma effect is called "0 pinch'': it can compress plasma to very high density, although for short times, corresponding to the duration of the electromagnetic pulse. 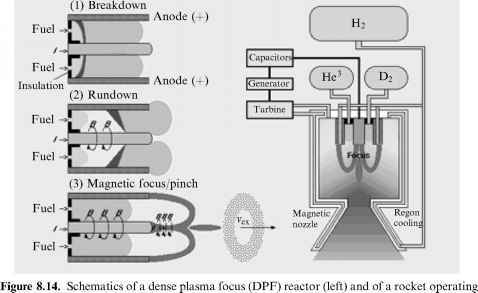 There is some experimental evidence hinting that in this unsteady mode plasma ignition may be achieved with DPF devices much smaller than steady-state MCF reactors. 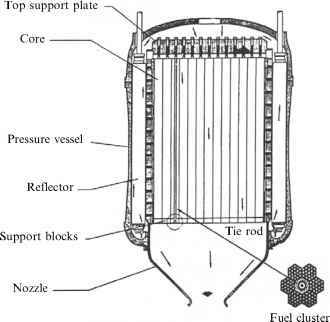 Plasma periodically formed in DPF reactors may be ejected alone, as the sole propellant, or may be first thermalized in a flow of inert H2 propellant. In this second case, temperature of inert plus plasma is lower, Isp is also lower, but thrust is higher. 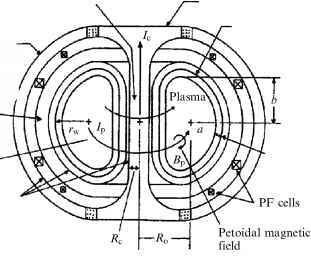 Acceleration of the mixture formed by plasma and inert takes place in a conventional or magnetic nozzle (Figure 8.14, right). Depending on whether H2 is added or not, the ideal Isp predicted is of order 4,000 s to 106 s. In the latter case the thrust is very low. the US, not only from researchers at universities, but also from commercial companies; see for instance [Lerner, 2004].